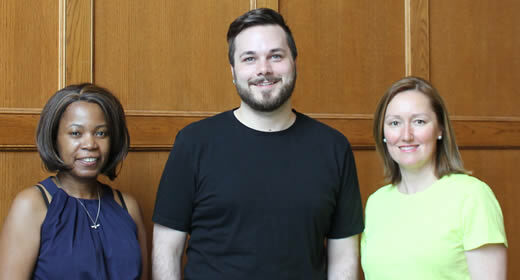 Congratulations to Nick Pfost, Alex Thebaud, and Zuzana Wisely for receiving 2018 Ford School Staff Recognition Awards. The presentation of peer-nominated and evaluated Staff Recognition Awards are a highlight of the Annual Ford School Staff Retreat, which was held this year on June 7 and focused on "Communicating Across Differences". Pfost, who is on the communications and outreach team; Thebaud, who works in the business office; and Wisely, who serves on the International Policy Center team, were recognized for exceptional contributions to the Ford School mission. The winners were selected for their high standards of professional service and and outstanding contributions. The award comes from a bonus, as well as praise and a hearty congratulations from the Ford School community.